The highest-resolution satellite imagery available in Google Maps cannot yet read print in a newspaper, but Google's Street View could possibly read the headlines. 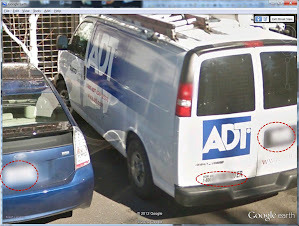 License plates, for example, can be seen in Google's Street View imagery so there is a detection process in place to identify and blur license plates to prevent identification of vehicles and individuals. In the screenshot below you can make out part of the "How am I driving" bumper sticker including telephone numbers on the truck. The license plate and part of the bumper sticker are blurred during post-processing of the photos. Using Google Earth or Google Maps when you zoom into Street View showing the Sherman Oaks Newsstand in LA you can make out some cover titles off various magazines such as Vogue, GQ, Aficionado, Money, Golfer, Running, and others. Unfortunately, the newspapers are facing upward at a tilt so you can't read those, but you could technically read the headlines if they were facing towards the Street View camera. So the answer to the question is yes you can read a newspaper in Google Earth but only the headlines. You just need someone to hold up a newspaper while a Google Street View car is taking pictures. In the "near" future if the resolution of the imagery improves enough then you just may be able to read the dates off of newspapers (this would provide definitive proof when a photo was taken) but that is a long way off. This question was originally asked in Answers.com here.